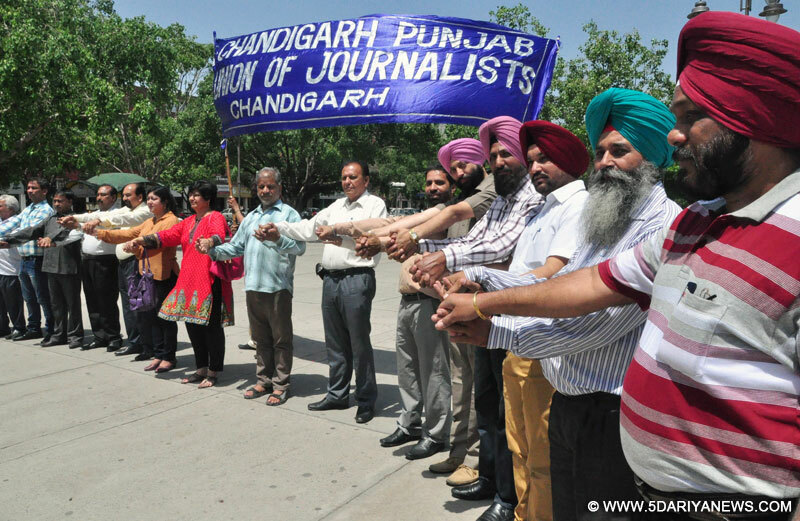 The Chandigarh-Punjab Union of Journalists(CPUJ) organized a rally at Sector – 17 Plaza to mark the May Day and to recall sacrifices of the people who gave up their lives for the cause of working class. On this occasion a large number of journalists formed a human chain by holding hands of one another to press their genuine demands.While addressing the rally CPUJ President, Mr Vinod Kohli, expressed deep concern over so for not implementing Majithia Wage Board by many newspaper managements .He urged the newspaper managements to implement the Wage Board without further delay. Kohli further demanded inclusion of electronic media in the purview of the Press Council by renaming it as the MediaCouncil. This he said, would help in addressing the issues related to the electronic media.Earlier a two minutes silence was observed to pay homage to the founder member of CPUJ Mr. Bhupinder Singh Abhaypuria of Mohali who expired recently.